Your Wedding is one of the most important days of your life. Let the Atrium relieve your wedding stress and be a part of your special day by providing you with unique and highly personalized services by our professionally trained staff who will ensure your day is perfect from start to finish. 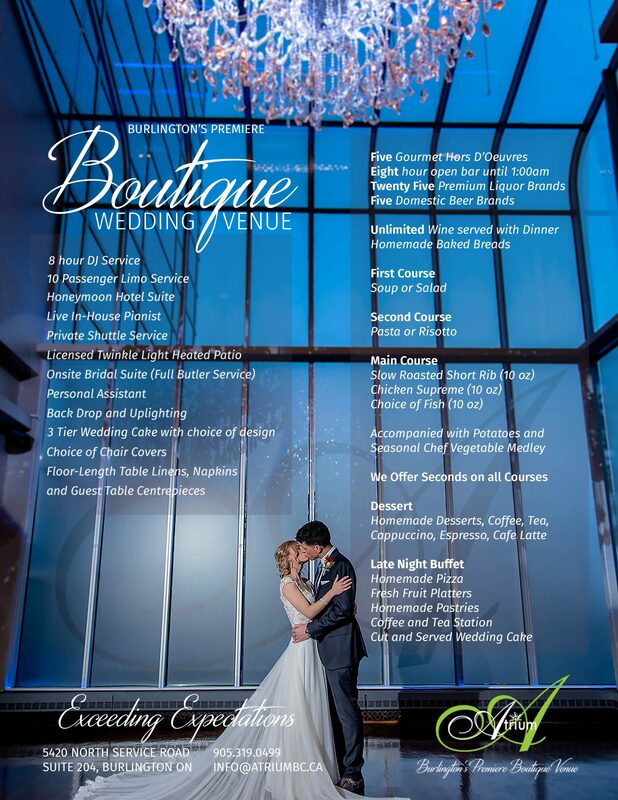 With the Atrium, your wedding package includes a personal assistant to help coordinate your special day. You can get ready in the Atrium’s lavish bridal suite, while your guests are greeted with red carpet service and welcomed into the private cocktail lounge. The grand dining room’s white glove service is in a class of its own. The Atrium Flyer describes all the services the Atrium provides in detail. Please also see the Atrium Ceremony Package for the onsite ceremony that the Atrium offers. We are honoured to help you take the first steps to plan your special day.